This is the final book from Zig Ziglar and it feels like a “Best of..” compilation to me. It has the best of the best of his presentations from the last 40 years. It’s hard to believe that “See you at the Top” was written over 40 years ago as I type this. 40 years of inspiration boiled down to about 4 hours of reading is a lot to ask, but Zig and Tom deliver. I’ve seen a few different covers to this book but I think the QR Code cover is current and just like this book, it could, and should get updated in years to come. I can hear Zig in my head with his signature delivery style when I read this and my colleagues and I try to deliver out own versions of his lines on a regular basis. The fact that Zig has people in a call center ranging in ages from 20 – 50 still actively reading his material and entering into dialogues about it in a casual work setting speaks volumes. I follow @thezigziglar on twitter, I listen to the downloaded books on my phone, just like thousands of people before me, have on iPod, CD, or even Cassette Tape and I have read half a dozen of his books at this point. I can say that it’s remarkable how relevant his material has stayed. Zig offers a great foundation for a sales career and his material can help anyone’s mindset. 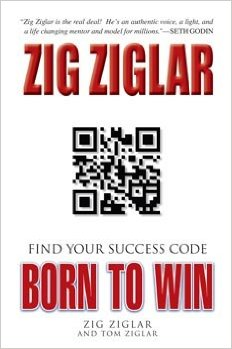 If all you did was read and follow Zig’s advice you’d do very well in this business. I’ve said it before and I’ll say it again. I believe that average and below average salespeople just “wing it” and expect to get better from just doing the same things over and over. The problem is that these salespeople don’t actually study their own business and learn from it, they literally just stay stagnant or get left behind when the business changes. The above average salespeople find a mentor and truly study their business and attempt to get better. The absolute best salespeople steal from the best and make it their own. This means you’ve got to read and be familiar with Zig and then once you master his material keep an open mind and add it to your own experiences including your experiences with other authors, motivators, and coaches.